Latest News!!! New Rules Has Been Introduced for Railway Jobs Seekers: Recently, Railway Recruitment Boards has issued a public notice that Aadhaar Card Now Mandatory to Apply For Railway Jobs. The Railway Recruitment Board means that applicants must have their Aadhaar Cards as Identity Proof. If you want to do Job in Railway Sector and going to apply for Railway Recruitment, so you must have the Aadhaar Number which will be used at the time of Registration. In order to ensure fair organize of RRB Exams; RRBs have made it necessary for all applicants. Why Aadhaar Card Is Necessary for Railway Exam? Determining the proof of applicants at the time of examination is significant for fair conduct of RRB Exams and avoidance of attempts at impersonation. This is the best and suitable mode of verification for the applicants. Other than, Biometric attendance systems will also be set up at the time of exams to gather and match the applicant’s fingerprints with those given in the Aadhaar cards. The requirements of Aadhaar Act and the Policies under the Act have come into effect from 14.09.2016 and notifications to this effect have been released in the Official Gazette. Consequently, applicants wishing to apply for job in the Railways, henceforth, are requested to get Aadhaar Cards may provide their 12 digit Aadhaar number at while filling the online application form. 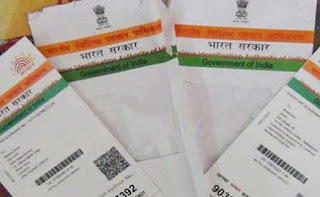 Such applicants who have registered for Aadhaar but have not received Aadhaar Card may provide 28 Digits Aadhaar Registration ID printed at the Aadhaar Enrolment Receipt. What are the Huge Changes? Information can be either 12 digit Aadhaar number or 28 digit Aadhaar registrations Slip. Fingerprints will be matched with the Aadhaar server only. In addition to this Railway Recruitment Boards, have additional requested all those applicants who are not registered for Aadhaar yet. Means that you aren't registered yet visit the nearest Aadhaar Enrolment Centre and get enrolled for Aadhaar Number. The above scheme is appropriate in all states and Union Territories of India except state of Jammu & Kashmir, Meghalaya and Assam. Candidates from these states may enter in online registration form, Voter-ID number, valid Passport number, Driving License number or any other applicable Government Identity Card number during applying for upcoming Railway Recruitment Board Recruitments. Contenders if you find any query regarding Aadhaar Card Now Mandatory to Apply for Railway Jobs, then you can drop your comment in the comment box which is provided below.